Mussels are veritable masters of biomineralisation. They make hard, robust composite materials from simple substances in order to build their shells. Furthermore, the shell material itself is produced in an exemplary way. 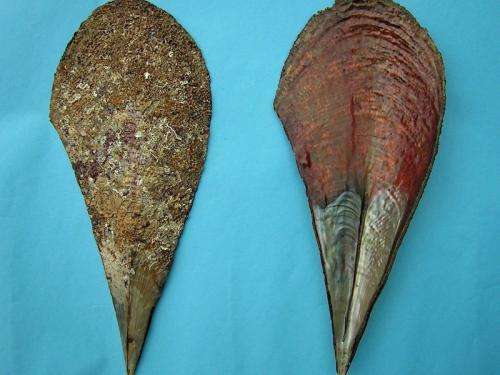 A Franco-German team working with scientists at the Max Planck Institute of Colloids and Interfaces in Potsdam studied the giant Mediterranean fan mussel Pinna nobilis and was able to acquire a better understanding of crystallite growth. The scientists found that the calcite crystallites in the outer prismatic layer develop in a very similar manner to that of crystallites observed in metals, and in line with materials theories. Accordingly, a number of large crystallites continue to grow, displacing smaller grains, which gradually shrink. The results show clearly that the mussel, a living organism, employs processes that are similar to those used to optimise steels. This means that besides providing the thermodynamic conditions for calcite grain growth, such as temperature and precursor concentration, it does not influence the process. Evolution has produced many biological materials – a treasure trove for science. These natural materials often possess extraordinary mechanic properties and are ideally adapted for their purpose. Living organisms only use a small number of chemical elements for adhesion or protection, or as hunting weapons. Still, they make up for this lack of chemical diversity with sophisticated structures. Mussel shells are excellent examples: They mainly consist of hard but brittle calcite; the same calcium carbonate that can paralyse washing machines. However, by gluing the calcite grains together with a protein, the mussel produces the iridescent nacre, which lines the interior of its shell, as well as the prismatic layer, which makes up the larger part of the shell and is significantly more robust than pure calcite of the same thickness. Scientists working with Igor Zlotnikov and Peter Fratzl from the Max Planck Institute of Colloids and Interfaces have now acquired a deeper understanding of how calcite grains grow in the prismatic layer. The Franco-German research team has now analysed the prismatic layer on Pinna nobilis using high-resolution microtomograpy: Using the particularly intensive X-ray radiation at the European Synchrotron Radiation Facility (ESRF) with a kind of computer tomography similar to the one used in medicine, scientists produced a microscopic 3D profile of the calcite layer. In this profile, scientists were able to detect structural details measuring just a few micrometres in the prismatic layer. They found that the usually hexagonal crystallite viewed from above most closely resembles a distorted honeycomb. The further you look into the layer, the larger the average diameter of the prisms becomes – the microstructure becomes coarser. The calcite columns record the crystallite growth in a kind of frozen film: Since the crystallites only grow at the lower end, the top end shows how large the grains were at the onset of growth, as well as their initial distribution. In the prismatic layer, it is then possible to trace the changes of their microstructure, i.e. the size and distribution of the calcitic crystallites during growth. "In the prismatic layer, we were able to study the formation and evolution of individual grains in detail," says Igor Zlotnikov, head of the study. "They offer a perfect example of crystallite grain growth." In fact, calcite crystallites in mussel shells grow exactly as predicted by textbooks on materials physics. The scientists were surprised by their own observations in more ways than one. Firstly, this was the first detailed insight into grain growth. Previously, the process had mostly been studied in computer simulations. Secondly, they did not expect to find that calcite crystallites produced by mussels would grow in exactly the same way as those in steel or aluminium alloys. It was much more likely that the mussel would control growth more strictly, and that the crystallites would therefore have a different shape than in inorganic conditions. "The formation of the shell can thus be described using thermodynamic models," says Igor Zlotnikov. These models only take into account the chemical and physical conditions for crystallite growth and would not describe the process correctly, if the mussel would influence the size and distribution of the crystallites. "The mussel apparently only influences the growth process in that it determines the thermodynamic conditions, namely the temperature, pH and precursor concentration," explains Zlotnikov. 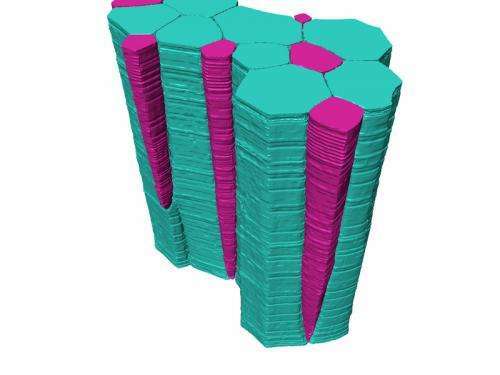 "This is completely consistent with what we would expect from microstructure development in inorganic polycrystalline systems," Igor Zlotnikov says. "Our results show us how organisms use physical conditions to create complex shapes. And they help us understand which environmental conditions determine the shapes of organic minerals." By studying natural diversity, Igor Zlotnikov and his fellow scientists now want to explore how organisms control the structure of biominerals using thermodynamic boundary conditions and the scope the organisms have to produce versatile materials. For this purpose, they plan to look at the principles that other mollusc species use to control the microstructure of their shells. In contrast to most other work conducted by Peter Fratzl's department on biomaterials, the findings from the current study are not directly useful for developing new technical materials. In this case, the situation was reversed. Theories about grain growth were developed in materials science and were useful for, for example, refining the properties of steel. The results from research into technology have now helped the Max Planck scientists in Potsdam acquire a better understanding of a biological process. The mussel uses physical principles for its own benefit, namely to produce the specific structure of its shell.